Cut the sliced crusty bread into cubes and add to a baking tray, drizzle with olive oil, sprinkle with salt then bake in the oven until lightly toasted (2-3 minutes). Grill the chicken breasts on a hot griddle pan until charred on both sides and cooked all the way through. Set aside to cool on a board. Add the mayonnaise and sour cream to a bowl. Finely chop two salted anchovies and add it to the bowl with the minced garlic. Add a sprinkling of pepper and a tiny pinch of salt. Mix to combine. Roughly chop the iceberg lettuce and add to a large mixing bowl with the croutons, marinated anchovies and capers. 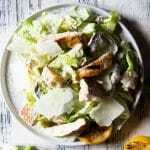 Slice the chicken into small strips and add to the rest of the salad with the dressing. Toss the salad until everything is thoroughly coated in the dressing. Serve in big bowls with shavings of parmesan and sprinkling of pepper. Tip: Let the chicken cool while you make the rest of the salad before cutting. That way all the flavour and juices stay inside the chicken. If you cut it too soon the juices will run out. You should be able to find marinated pickled white anchovy fillets in the deli section of your supermarket. If you don't just leave them out, this salad is still delicious without.